Costa Crociere confirms that on March 5, Costa neoRomantica while sailing off the Sardinia East Coast on her voyage from Trapani to Marseille experienced very rough seas with waves between 6 and 7 meters and strong wind with gusts up to 60 knots. The ship has always been under control with propulsion and navigations systems always fully operational. All the relevant Authorities have been promptly notified. Safety for guests and crew members is Costa’s first priority. The Captain and his officers have been fully engaged in managing the situation and Guests have been promptly informed and updated by the Captain. The rough sea conditions caused an inconvenient to one of the anchors which was released without affecting the continuation of the voyage. Due to the delay accumulated the call in Marseille scheduled on Fri 6 has been cancelled and the ship proceeded directly to Savona. The Company strongly focused on minimizing the discomfort for its Guests determined by a force majeure. Costa neoRomantica left Savona after clearance from the Authority at 7.45pm Sat March 7. During the call in Savona, together with the Flag Certification body (RINA) and the relevant Authorities we conducted the testing phase subsequent to the restoration works we performed after the very bad weather conditions Costa neoRomantica faced. The works have been conducted under the supervision of the relevant Authority for the appropriate safety certification. Under the clearance of the Flag Authority ship sailed to Naples on Sat March 7 evening as per planned itinerary. Costa neoRomantica is currently continuing her cruise as scheduled. A Costa Cruise ship sailing in the Mediterranean has been affected by bad weather conditions including strong winds. 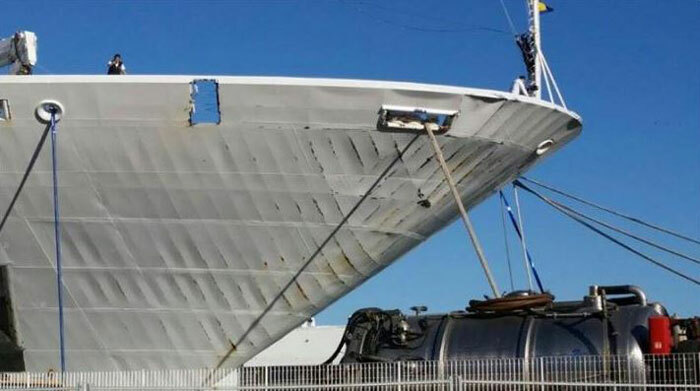 Apparently according to local Italian media the neoRomatica which is operated by Costa Cruises had a scary ordeal during a Mediterranean cruise. The ship sailed into a storm on Thursday night March 5th near the vessels last port of call at Trapani, Sicily. The storm was producing wind gusts of around 60 mph which also caused strong waves to hit the 57,000 gross ton cruise ship. “My boss is on board, I confirm cabins flooded (including that of my head, not accessible to virtually all day yesterday, the water is coming down from the ceiling, wetting the bed and carpet, you name it) and the black out” . So it seems some Cabins had been flooded but this could have been from water pipes inside the ship. With the heavy rocking and banging of the waves against the ships hull it’s possible that pipes could burst. As a result of the damage the ship diverted to Savona, Italy instead of sailing back to its home port of Marseille, France. Passengers were taken back to Marseille by bus. Cruise Hive has requested further details from Costa Cruises and will update this report once we get a response.